From time to time, there are very interesting photography-related campaigns on Kickstarter. One of them is Illuminati, a wireless light and color meter for photography and filmmaking. It syncs with your smartphone to help you adjust the lights on set, measure white balance even in the trickiest situations and set your camera to take the color-correct shots. There are a few benefits to using this gadget to improve your photography and videos. In his recent video, Jay P. Morgan gives you several reasons why you should use this color meter and how you can benefit from it. 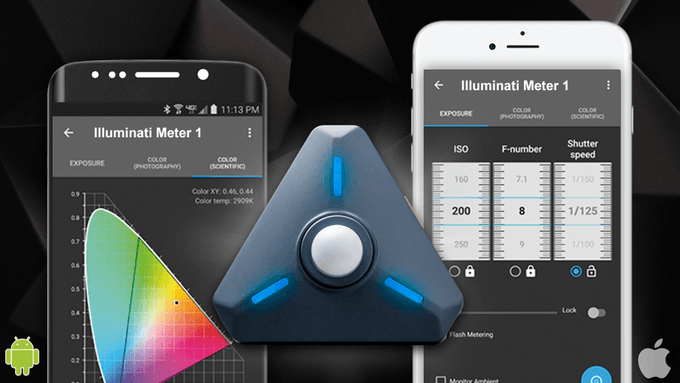 The Illuminati meter is the world’s first Bluetooth light and color meter that works wirelessly with smartphones. It’s small and compact and you can place it anywhere in the scene. It will measure the ambient light and color and send the readings to the related app, along with the suggestion for the camera settings. It’s the first system that lets you use multiple sensors simultaneously. You can meter foregrounds and backgrounds, set strobe ratios, or monitor and manage multiple light sources or large areas at the same time. When you’re outside, the color of light doesn’t only depend on the sun. There are reflections from different surfaces, and all of them cast different colors. Illuminati meter will help you measure the color of light and set the white balance and exposure for the perfect skin tones. Of course, you can always use a gray card in a situation like this, but there are other situations where it could not be enough on its own. In a way, this is similar to shooting outdoors. Only here there aren’t only reflections of light off different surfaces, but also different types of lights. Again, the color meter could help you get the best settings and results. If you’re using LED lights for indoor shooting, the color meter can help you measure the correct color of every light and match the color of LED with them. If there are different lights on set, you can test each of them to make sure they all have the same output. The Illuminati app will even suggest the gels you should use to correct the lights and level them so they all have the same temperature. A good color meter can measure the color of the strobe and the ambient, so you can correct the strobe and match these two lights. The Illuminati color meter can measure the color of the strobe and suggest the corrections. The Illuminati color meter is easy to use, and you can connect it to your smartphone or smart watch. It’s fairly inexpensive, too. You can preorder one for $229, along with a case, accessories and the app, and the shipping is expected to begin in September 2017. And for more information, head over to their Kickstarter campaign and see other offers and details. It is amazing how people have forgotten there used to be this thing called color photography before digital. There is an entire collection of charts, graphs, and slide rules that used to be used to figure out what filter was needed. Most of them were (and are) free. If it wasn’t for the Arduino/Maker groups creating a mass market for color sensors, this wouldn’t exist. It still costs as much as they used to. You just buy the control and display separately now.